Back in my review of Ocean at the end of the Lane I mentioned that works of Neil Gaiman have a unique, recognizable style and mood. Gaimain is the undisputed master of mixing modern sensibilities with folk myth and magical mysticism almost creating something to a genre of its own. There is magical realism which spruces up modern tales with a dash of supernatural, and there is “Gaimanism” which swings the other way and anchors pure folklore and fantasy with a dash of reality. When people call a work “Gaimanesque” fans of his work instinctively know what to expect: a well mixed blend of old, forgotten mystical lore and something modern. Pretty Deadly by Kelly Sue DeConnick and Emma Ríos is exactly that: a Gaimanesque re-imaging and blending of a western, horror and folk tales about death and destiny. The book’s setting is the archetypical, familiar western setting, complete with small desert towns, corrupt sheriffs, and shady saloons. But the very first pages establish that this is not a mundane western story. In this world the land is magical, and the legends are real. Folk songs and old wive’s tales are forgotten truth, and one is best to heed their warnings. In Pretty Deadly world, Death himself is a gunslinger with a horse skull instead of a face, who often meddles in the affairs of mortals. His grim rippers travel the world and do his bidding, and the only person who openly defies him is his mortal daughter Ginny. She rides the wind, and comes to the aid of those in need if they know how to summon her with a special rhyme whispered into the breeze. Like in a Neil Gaiman story, the supernatural elements are woven into the fabric of the reality of this world and inseparable from it. I would not call myself a fan of the western genre. It is not something I read or watch often, and I don’t typically seek out stories about cowboys and gunslingers. But I was enthralled and captivated by this series. If I had to give you an elevator pitch, I would probably describe Pretty Deadly as: Sandman meets Preacher , meets Dead Lands with a pinch of American Gods thrown in for a good measure. I keep mentioning Neil Gaiman as if it was his story but it isn’t. Even though these comparisons are meant as a positive praise (I consider myself a long time Gaiman fan) I think these comparison might be doing a disservice to the excellent writing of Kelly Sue DeConnick. This is after all, her world, and her story being brought to life by the art of Emma Ríos. Their work is not a mere imitation or emulation of that particular style. Pretty Deadly invokes Gaiman’s style, but then goes beyond and builds something new and original on top of it. DeConnick expertly manipulates the Western setting, playing up familiar tropes only to tear them down and brutally subvert them. Characters you have pegged as bad guys, turn out to be unexpected heroes. Those you have assumed to be good guys are shown despicable. Even the all powerful Death ends up being developed into a tragic and complex character. But western tropes are not the only things that are being subverted here. DeConnick and Rios conspire to break all the rules, starting with unconventional and unorthodox paneling. Rios uses the panel composition to create these claustrophobic funnels that build pressure and tension, or to direct action, and caged of inset areas to inform the surrounding action. Sometimes the panels bleed into each other, other times the panel lines become part of the architecture and set design. The most interesting feature of her art however might be how she stages her combat scenes which sets her apart from most of her peers in the industry. 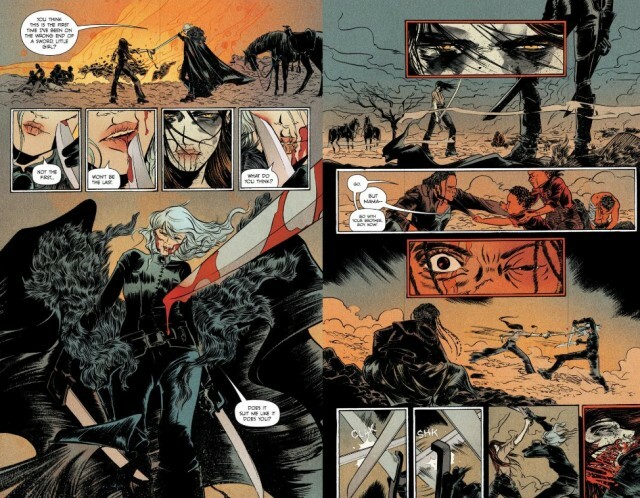 Female warriors in comics who are depicted as fast, shifty, untouchable are inherently at a deficit in their depiction to analogous male characters–because they create two spaces within their existence: one is the space that, if only they could be caught, then they could be conquered sexually, and the other is that their movement itself is meant to create the image of the beautiful untouchable woman on a pedestal that is the problematic way some men are taught to view women outside of these action packed scenarios. But here’s the thing. Flesh is flesh. Blood is blood. Whether it comes out of a woman or a man, it is still blood. Pain is equal, fighting for your life is an animalistic experience that is not in any way tied to gender. The notion being that sacrifice of blood for a final victory would be the domain solely of men is atrocious. 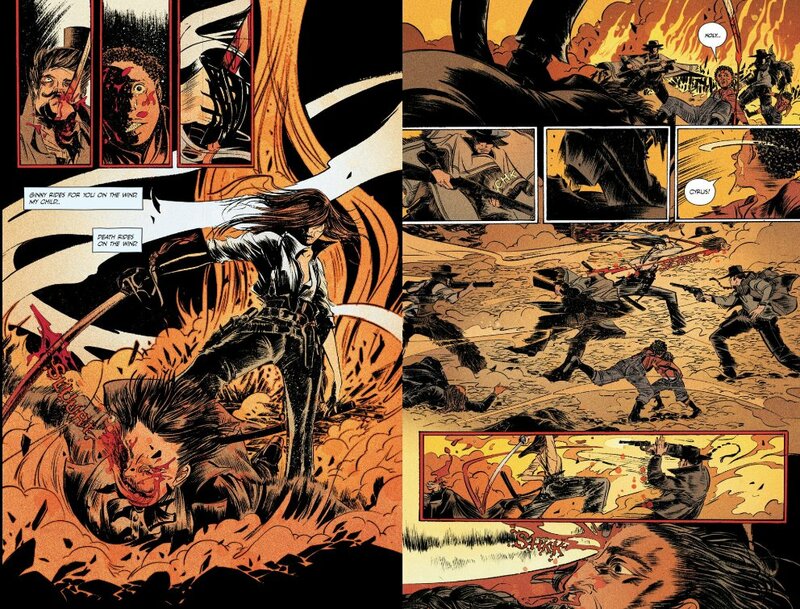 For context, Horrocks is comparing and contrasting Pretty Deadly with Blade of the Immortal by Hiroaki Samura with respect to how these works depict female fighters. The entire article is worth reading, but I think the excerpt quoted above works well as a glowing recommendation of the book. 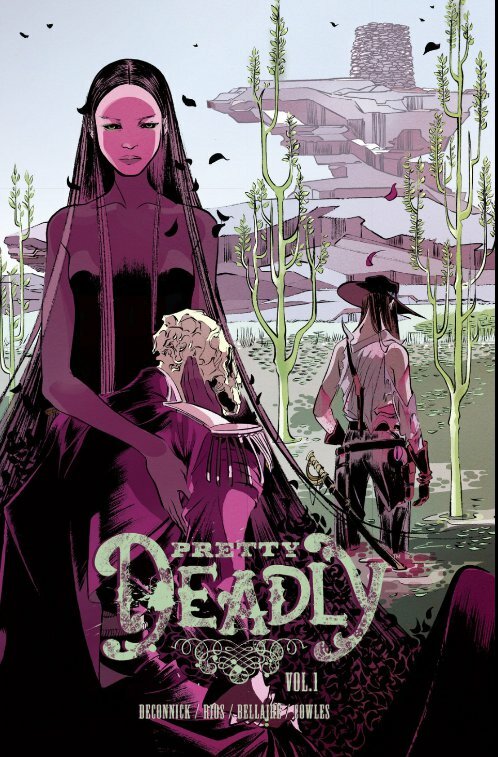 Pretty Deadly is not just a blend of western, horror and folk tale. 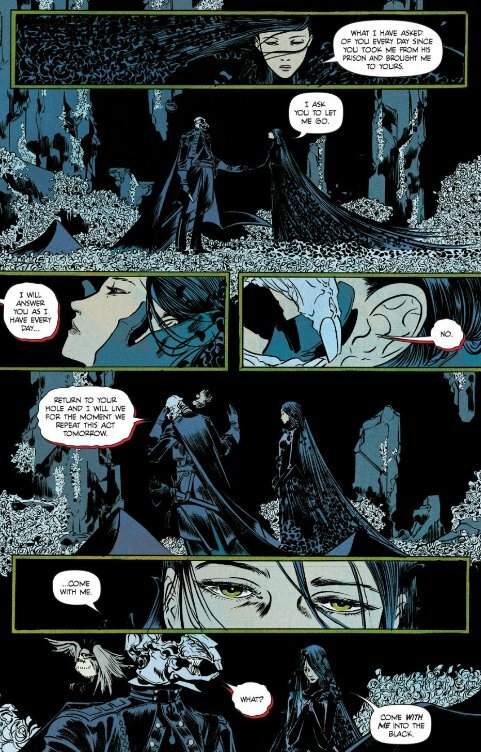 It is a western, horror folk tale centered around strong complex women (both as protagonists and antagonists) which manages to completely avoid objectification so endemic and entrenched in the comic book medium. If that, combined with the fantastic writing and striking and unique art style is not enough to convince you to read it, I don’t know what is. If you read only one comic book series this year, make it this one. I absolutely loved Pretty Dearly both for the mythic feel and amazing artwork, and the details like talking to the Bone Bunny. The stories told, the characters unveiled – a pretty unique piece, all in all. 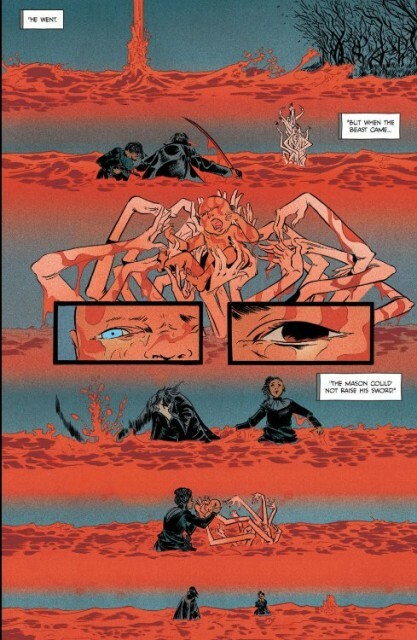 Somehow in my mind it’s connected to the East of West, and of course, they are very-very different, but some of the aspects share a similarity. I forget, have you read Locke and Key? Yep, butterfly and bunny are great. I also like how the reapers turn into hordes of butterflies when their mortal bodies are killed. I actually picked up some issues of East of West the other day to check it out. Have not read it yet, but it is on my list. Yes, that series. I feel like it’s in the league of its own. Lovecraftian motives, amazing visuals and the whole theme of keys hooked me in instantly.